ABUKAI Blog: ABUKAI Now Makes it Easy to Track Mileage Expenses While On the Go! ABUKAI Now Makes it Easy to Track Mileage Expenses While On the Go! With ABUKAI Expenses, when you take a picture of this note with your smartphone this information is automatically entered into your expense report with mileage expense calculated using a standard mileage allowance rate, or for custom enterprise deployments of ABUKAI Expenses, any rate established by your company. This simple method for ABUKAI Expenses users to capture mileage information increases the likelihood for mobile workers to report mileage expenses on a timely basis while still on the road. 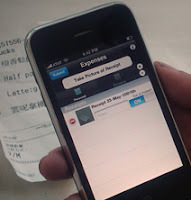 It also blends nicely with the process ABUKAI Expenses users employ to track their other expenses where they need only to take pictures of receipts to have expenses entered into their expense reports. What could be easier?